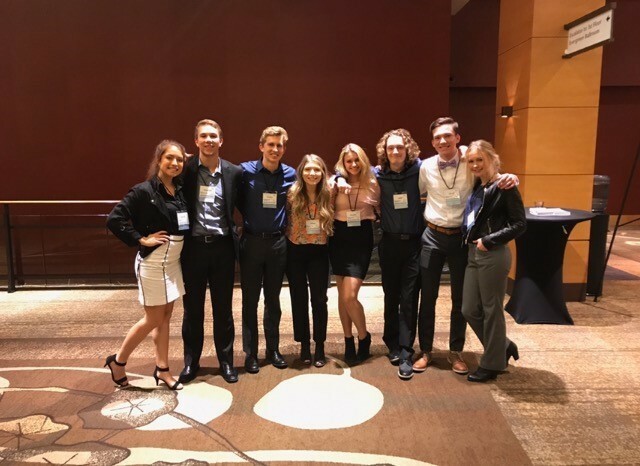 At the end of October, eight RHS students were fortunate enough to attend Washington’s DECA Fall Leadership Conference in Bellevue, Washington. DECA, also known as Distributive Education Clubs of America, is a career and technical organization made up of students at both the high school and college levels and teachers of marketing, management and entrepreneurship in business, finance, hospitality and marketing. It prepares leaders and entrepreneurs for careers and education in these and other business areas. This is Ridgefield High School’s first year as a high school chapter of DECA, so the conference served as a great opportunity for the students to gain a better understanding of the organization. The students, Jonathan Flury, Jaden Gorder, Lily Maul, Kenadi McCaskill, Kelli Paterson, Tim Radosevich, Joey Vossenkuhl, and Rachael Werbowski shared photos of their experiences at the conference. View them by clicking here. Andrea Reinertson, RHS business and marketing teacher, believes that the Fall Leadership Conference was exactly the platform needed to provide the strong start to the high school’s DECA chapter, noting that the high school’s DECA member count climbed from 9 to 23 members when the students returned from the conference. The district is grateful for the contribution made by an anonymous donor to RHS’ DECA program. Without the donor’s support, attendance at the conference would not have been possible. Students interested in joining RHS’ DECA chapter can contact Andrea Reinertson, RHS business and marketing teacher, at andrea.reinertson@ridgefieldsd.org.